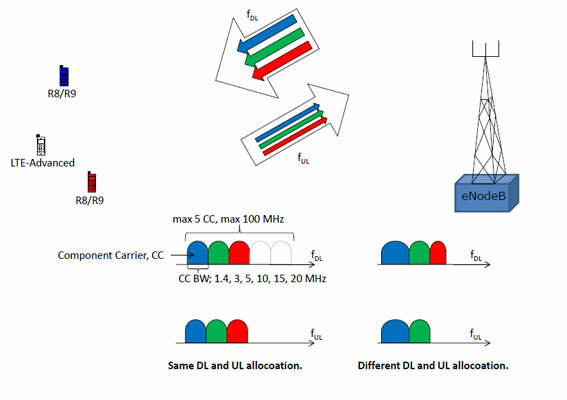 Carrier Aggregation(CA) is one of the most desired feature of LTE-Advanced. In LTE-A aggregation of carriers is used to increase the bandwidth and thereby increase data rates upto 1Gbps. Each aggregated carrier is referred to as Component Carrier(CC), can have BW of 1.4, 3, 5, 10, 15 or 20 MHz. LTE-Advanced allows aggregation of upto five component carriers to attain a maximum aggregated bandwidth of 100MHz. CA is supported in both FDD and TDD modes. In FDD the downlink(DL) and uplink(UL) can have different CCs, but UL is always lower or equal to DL. Also the CCs can have different carrier BW. In TDD, the uplink and downlink CCs should be same and have same carrier BW. CA Bandwidth Class defined based on maximum of ATBC and maximum number of CCs.